This is a 1 bedroom, 1 Bunk-room and 2 bathrooms condo. There are sleeping accommodations for six including the queen size sleeper sofa. Views of the pool and gulf from the living room , kitchen, dining area and the patio. View the gulf from the master bedroom. It is not just a typical rental. This condo is prime location in building for views and privacy. Tile throughout unit and patio (Carpet in master bedroom). Fully Equipped Kitchen with better grade cookware/cutlery and a Dining area. The free-form, bi-level, tropically landscaped pool is INCREDIBLE! It is 5,000 sq. ft bi-level, infinity edged with a mushroom fountain, and 9,000 sq. ft. of paverstone deck for sunbathing. There is also a heated spa. This pool is one of the nicest in Destin! Other amenities include 300' of gated private beach access and multiple outdoor grilling areas. This is located in one of the newer buildings on Scenic Gulf Drive and is centrally located to all Destin attractions. Within a 3 mile radius you will find outlet mall (called 'The Nation's Largest Designer Outlet Mall,' with over 100 brand-name stores), specialty stores, fine or casual dining (in fact three restaurants- two being directly on the gulf -are just a short walk away), night clubs & movie theaters. You are only a short drive to Destin's beautiful harbor, home to the largest deep sea fishing fleet in Florida. If you are a golfer you will find 1,080 holes of golf in our area, many are famous name designer golf courses such as Tom Fazio, Greg Norman and Fred Couples. 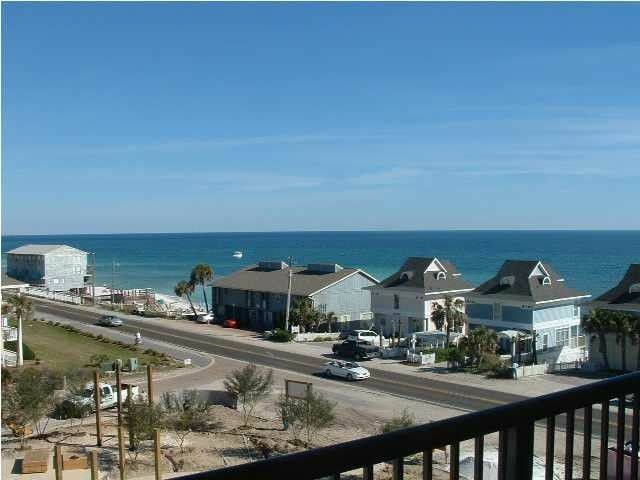 This condo offers gulf views and many wonderful amenities in this quaint 5 story building with only 64 units! This condo includes a private gated and covered parking space just steps away form the elevator. Great floor plan. Kid Friendly: one of the best pools in destin....really! bunk room in condo, and the young ones have their own television and PS2 game console. And our private beach is one fantastic sandbox. Beach service is available. Minimum Age Limit for Renters: Must be at least 25 years of age to rent. Minors that misrepresent will be evicted. Condo was great for my husband and myself! Clean, friendly neighbors, great beach. Weather was terrible. Tropical storm came through most the time we were there but the day and a half that we had good weather was amazing. Kitchen well-equipped, loved the beach service where they sat up chairs and umbrellas for us. Bed and pillows were super comfy! We loved the condo and would rent again in a second! Clean, quiet and across the street from the beach! I was very pleased because the pictures online were exactly what it looked like in person. The condo was clean and well equipped with towels, etc. I also really liked the property. The 2 pools and hot tub were very nice and also clean. Most of all the location was the re wa son we chose this condo. It was literally a hop, skip and a jump to the beach from the condo. I've already told my husband that I plan to return for my next vacation because I was very satisfied. We had a great stay at this condo. It was very clean and spacious enough for our family of 4. The beds were so comfortable and we slept great every night. The kitchen had everything we needed and there were plenty of extra towels in the bathrooms. The complex was quiet and had the best pool in the area, even though the water was a little warm during our July visit. We liked that this unit had a provided parking space in the parking garage, a nice little perk that not all units have! Of course the beach was perfect and we loved the included beach service. We had a great time and won't hesitate to stay here again! Lovely unit, lovely resort - great vacation! Our unit was clean, attractively decorated and in good repair. The bed was comfortable and the bunks were surprisingly comfy as well! The kitchen was well appointed (my only request would be the addition of some mixing bowls and measuring cups/spoons - everything else you could ask for was there). The view was lovely. The pool was PERFECT for kids - clean, warm, great design. We loved it! There were a few minor issues with the complex itself that were reported and will likely be resolved before the next wave of tenants. The beach was beautiful and the neighborhood is extremely nice, safe and well kept. We will definitely be back. The condo was great. We had a wonderful view of the ocean and lots of extras in it. The only negative was the weather. It rained everyday in late morning and early afternoon. Bummer! Really enjoyed our stay! Great condo and had everything we needed. Stayed in many places and was very pleased with the quantity of towels and washcloths. Didn’t feel like I was washing towels constantly. This is located in one of the newer buildings on Scenic Gulf Drive and is centrally located to all Destin attractions. Within a 3 mile radius you will find outlet mall (called 'The Nation's Largest Designer Outlet Mall,' with over 100 brand-name stores), specialty stores, fine or casual dining (in fact three restaurants- two being directly on the gulf -are just a short walk away), night clubs & movie theaters. You are only a short drive to Destin’s beautiful harbor, home to the largest deep sea fishing fleet in Florida. Golf: If you are a golfer you will find 1,080 holes of golf in our area, many are famous name designer golf courses such as Tom Fazio, Greg Norman and Fred Couples.